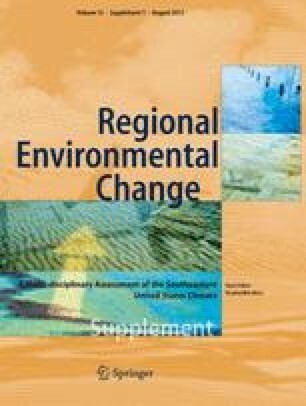 While secular changes in regional sea levels and their implications for coastal zone management have been studied extensively, less attention is being paid to natural fluctuations in sea levels, whose interaction with a higher mean level could have significant impacts on low-lying areas, such as wetlands. Here, the long record of sea level at Key West, FL is studied in terms of both the secular trend and the multi-scale sea level variations. This analysis is then used to explore implications for the Everglades National Park (ENP), which is recognized internationally for its ecological significance, and is the site of the largest wetland restoration project in the world. Very shallow topographic gradients (3–6 cm per km) make the region susceptible to small changes in sea level. Observations of surface water levels from a monitoring network within ENP exhibit both the long-term trends and the interannual-to-(multi)decadal variability that are observed in the Key West record. Water levels recorded at four long-term monitoring stations within ENP exhibit increasing trends approximately equal to or larger than the long-term trend at Key West. Time- and frequency-domain analyses highlight the potential influence of climate mechanisms, such as the El Niño/Southern Oscillation and the North Atlantic Oscillation (NAO), on Key West sea levels and marsh water levels, and the potential modulation of their influence by the background state of the North Atlantic Sea Surface Temperatures. In particular, the Key West sea levels are found to be positively correlated with the NAO index, while the two series exhibit high spectral power during the transition to a cold Atlantic Multidecadal Oscillation (AMO). The correlation between the Key West sea levels and the NINO3 Index reverses its sign in coincidence with a reversal of the AMO phase. Water levels in ENP are also influenced by precipitation and freshwater releases from the northern boundary of the Park. The analysis of both climate variability and climate change in such wetlands is needed to inform management practices in coastal wetland zones around the world. This work is supported by the Critical Ecosystem Studies Initiative, ENP Contract H5284-08-0003. CK was also partially supported by the Alexander S. Onassis Public Benefit Foundation Scholarship Program. TJSIII was supported by the USGS Ecosystems and GEPES programs. We thank Y. Kushnir and M. Cane for enlightening discussions. Many thanks are due to P. DiNezio for suggestions that significantly improved this manuscript, and to C. Alarcon for GIS support. Any use of trade, product, or firm names is for descriptive purposes only and does not imply endorsement by the U.S. Government.